Ohh, i wanna try this, as my joysticks having problems, however I'm a bit of a klutz, and scared of anything going wrong! It's a very annoying problem. it is my secondary phone (payg "going out" phone, so if i lose it/ damage it, it doesnt matter as much as if i lose/damaged my main phone) but i still wouldnt like to ruin it! Is there an alternative to help the joystick? or is this just the way? Get in! Thanks so much. Been having lots of problems with the joystick and now it is absolutely perfect. Feels like a new phone. I've never done anything like this before, and whilst there is quite a risk, I would definitely recommend doing it. Cheers mate for the quick guide of how to do this. Believe me it was very helpful! 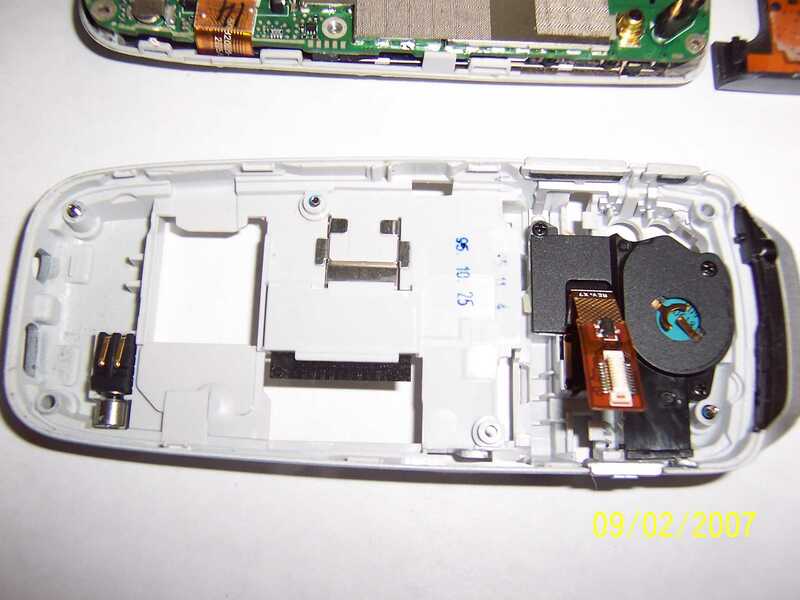 How did you remove the nub (joystick) - I just took my 2125 apart and cleaned under the nub and dustboot with a pipe cleaner but I could not get the nub on, it felt like the nub was glued or pressed on such that I could not remove it without breaking the switch. Also what was the point of the electrical cleaner - de-oxidization? Excellent! I'm gonna try this weekend, my joystick needs some cleaning. Just wondering: is this procedure (because the battery is going to stay disconnected for a while) forcing an hard-reset? I have read most of this thread I am not repeat not criticising the quality of the pictures but I would like to draw attention to pic number 4. I really do not want to take my phone to peices if it is not goona fix my problem, but I may have to if some can confirm to me that lil round bit of silver on the main baord is the damn battery that is causing my phone to reset the date and time very time I remove the main battery due to the lil bleeder being dead. if so where can i saurce one these asa replacement and how simple is it to change? 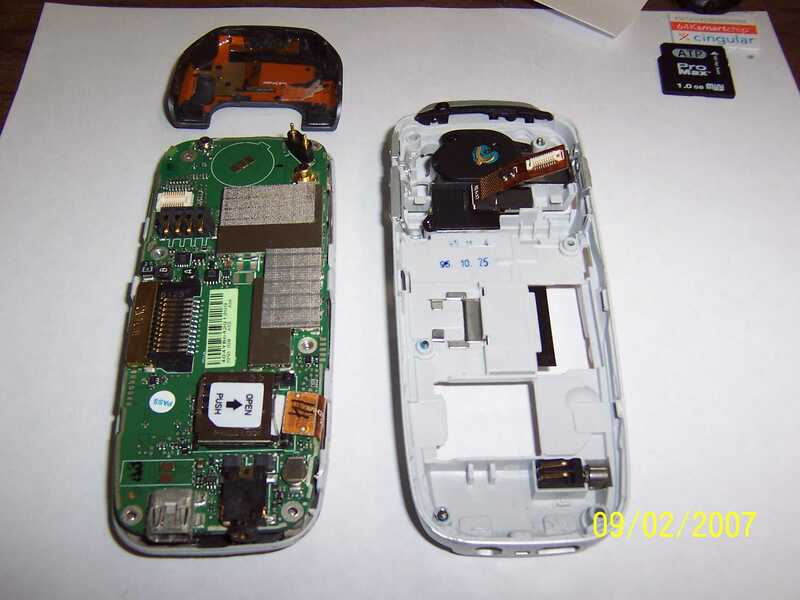 I used your guide to disassemble my Cingular 2125. I had dropped the phone and the #7 and #4 keys had to be pressed very hard to get them to work. Another person on this site had posted PDF file about disassembly to fix this same problem. I did get my keypad to work, but somehow lost a little clear piece of plastic (maybe an LED) that used to flash when my bluetooth was in use. Thats not a big deal as I rarely use it. Anyway, I took some pictures with a 3.1 megapixel Kodak Easy Share camera in "Close-Up" mode, while I had the phone apart. I've never posted pics here, but would be happy to email them to you if you think they would help. I appreciate the guide you put together, and wanted to see if these might be of help. Your guide helped me and I just wanted to offer these in case someone was interested. The following are a few examples. I didn't want to put all of them here if no one was interested. First, a note of caution. This is a *guide* you follow at your own risk. If you are in any way unsure, don't try it. If you've done a Typhoon or similar before, you'll have no problems. You'll need a good torx T5, a small flat blade screwdriver and a plastic tool to prise open the case. Try to work in a low-dust environment to minimise the risk of dust entering the screen area. First remove the aeriel cover using the flat blade screwdriver at a 45 degree angle in the two holes either side at the top of the battery. Prise the catches slightly until there is enough gap for you to insert your case opening tool ( or fingernal / knife etc) between the aeriel cover and chassis and lift the aeriel cover in an upwards and outwards motion. 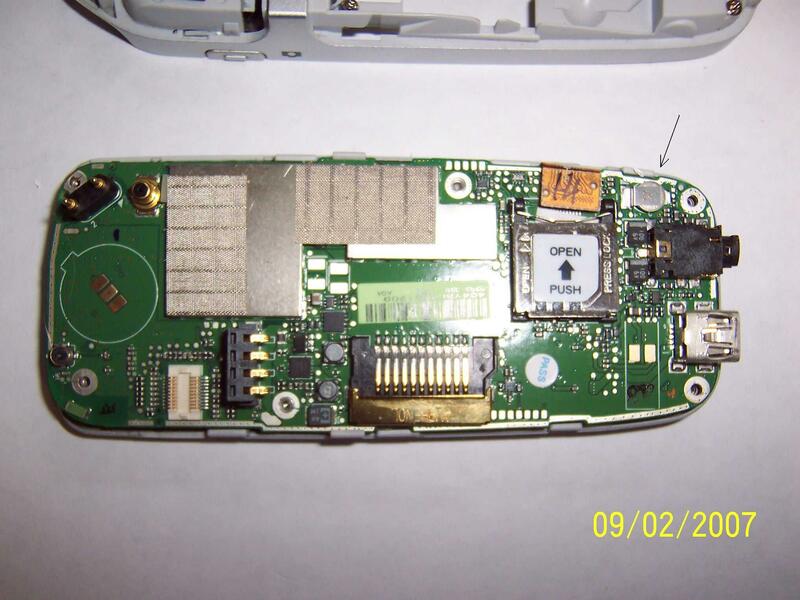 Once the aeriel cover is off, remove the 4 chassis screws ( two at the bottom, two at the top) and 2 circuitboard screws in the battery compartment. Next, take your case opening tool, turn the phone over so the LCD is facing you, and open the casing by sliding the tool between the fascia and chassis at a downwards angle from the bottom right corner. Once the fascia clips have been freed, lift the fascia / board out of the chassis starting from the top. 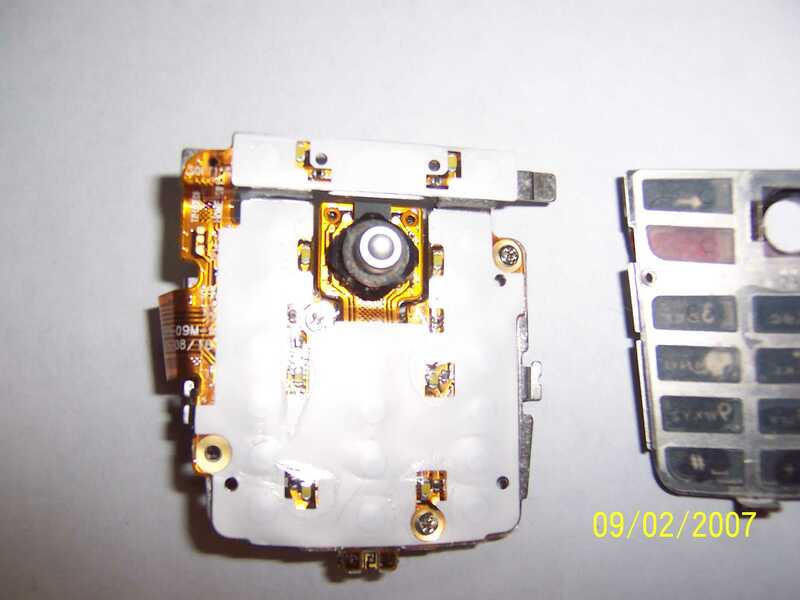 The camera / external speaker module is fixed to the chassis ( unlike typhoon) so take care to disconnect the ribbon cable once you have enough room to insert your opening tool to lift the connector. Don't just pull it apart. 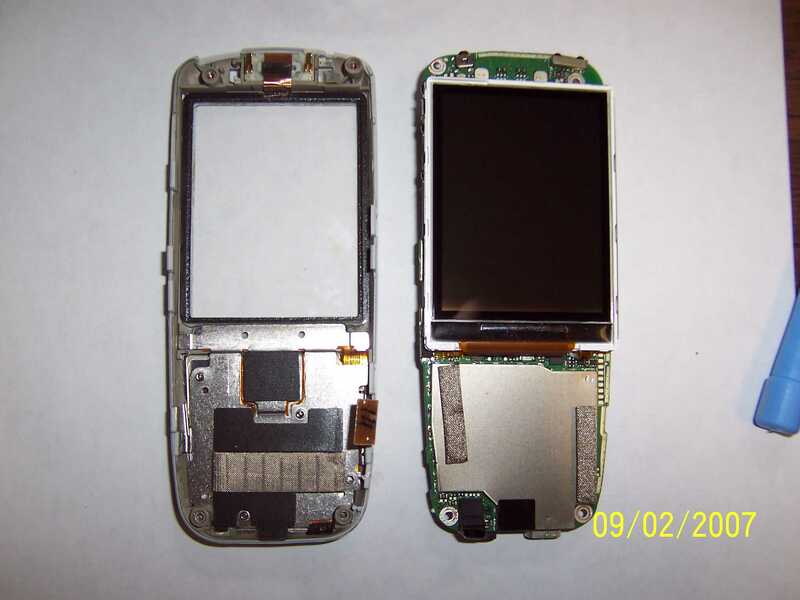 To remove the mainboard, first disconnect the keypad gently using your case opening tool or fingernail etc to lift the connector near the simcard gate. The mainboard is held into the chassis by two clips, 1 halfway down either side. Prise these away and slowly lift the board. If the LCD is firmly stuck to the foam surrond of the fascia use your case opening tool to lift it gently. 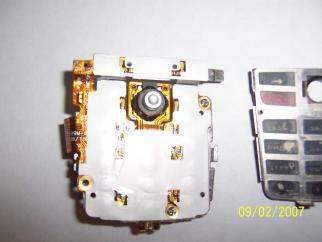 The keypad circuitboard is held in place by two clips. With the keypad face down, prise the left hand side up -do not pull on the connection ribbon - and lift the keypad upwards towards the earpiece to clear the locating lugs at the bottom of the fascia. Note the orientiation of the soft key rubber button pushers - if you get these the wrong way around on re-fitting the buttons will feel strange. The directional button has a dust cover underneath it - this unit's was full of dust! After cleaning this area with an old toothbrush I now find it more responsive. Refitting is the reverse of removal. Note, if you are replacing any cosmetic parts, you must ensure you do it properly. For example, make sure when swopping the earpiece you also swop the rubber surround as this provides dampening for the speaker casing and reduces tinnyness. any of them have a pic of the small battery that keeps the date and time? 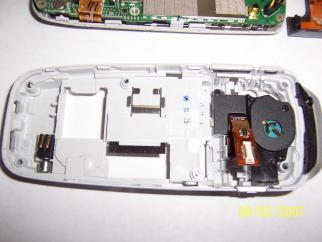 I've already put the phone back together, but I looked at my pictures and this one may show the battery. I tried zooming in to see, but couldn't be sure. It looks like a typical watch battery. If I have it open again, I will look for a part number. I'm not positive that this is a backup battery, but it does look like it may be. thanks it does look llike what i am going tobe looking at changing...or i might just get a new phone when the HTC s730 arrives. Yes I confirm it's a T5, I buy it on Internet by Distrelec. I would like to thank very much Richard for his guide ! I open my SPV C600 to try to fix by cleaning the joystick. Mine is completly dead. At the end I find a little black square on my desktop ! Thank you again for the guide ! I blew really hard like I was blowing into a trumpet with my mouth pressing up against the phone over the joypad/ joystick and it works fine again, i was about to throw it away as its been annoying me for days not been able to go down. its prob good idea to move the joystick in different directions too or maybe try some of the pc air compressor cleaner with the can in an upright postion as directed on the tin too as it can probably blow more directional and harder than i can been a smoker. Hope this quick soloution works for some of you too. AFAIK it keeps your phone settings and for example alarm clock settings but NOT the regular date/time you are expecting. The newer Tornado's have the same backup battery there, but also loose time and date after the main battery is removed. Apart from that, the battery 'clip' is spot welded to the top of the battery so you can't even (easily) replace it anyway. I've replaced that battery many times and cured the fault on various handsets. With wm5 on the tornado, if you shut down properly, even with the faulty backup battery, settings and alarms, texts, call histories etc are preserved even if the main battery is removed. On the ones I have repaired ( 8 and counting) replacing that battery (it's a standard cell that digikey stock ) has stopped the board loosing time and date. My Sp5m was one of the first made according to the build week, and it was one of the first I had to change it on.